We had another great day at the Northern Virginia Housing Expo in Alexandria on Saturday, March 24! 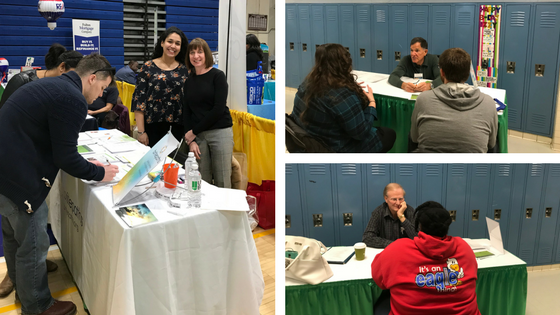 Six Financial Literacy volunteers from Britepaths and the Financial Empowerment Center at South County provided free Financial Counseling sessions for 22 Expo attendees, and we gave out information about our Financial Literacy offerings to many, many more who dropped by our table. We received a lot of positive feedback about the counseling sessions. One client came to the Britepaths table and spoke to our Financial Literacy Manager Carole Rogers after her coaching session and asked if she could be part of our Financial Mentoring Program. She followed up with Carole by email and is currently working to meet the requirements to be matched with a Mentor. We are grateful to the Northern Virginia Housing Expo organizers for making our Financial Counseling sessions a part of their event each March. Britepaths regularly offers free Financial Counseling Clinics in Alexandria with United Community Ministries and in Chantilly with Western Fairfax Community Ministries, Ox Hill Baptist Church and Fairfax County Neighborhood and Community Services. The Clinics are made possible through a grant from the Foundation for Financial Planning. Click Here to learn about Britepaths' Financial Literacy services and how to access services or volunteer. Britepaths manages the Financial Empowerment Center at South County thanks to a grant from the United Way of the National Capital Area and Fairfax County Neighborhood and Community Services. The FEC at South County offers free financial coaching by appointment, and schedules classes and workshops pertaining to financial education and life skills. Visit FECSoCo.org to learn more about offerings and to volunteer.